I slept pretty well in my room, but I felt rather down when I woke up. There were just too many things going through my head. I got up to go to the beach, sat under the shade and watched the waves lapping gently on the shore. 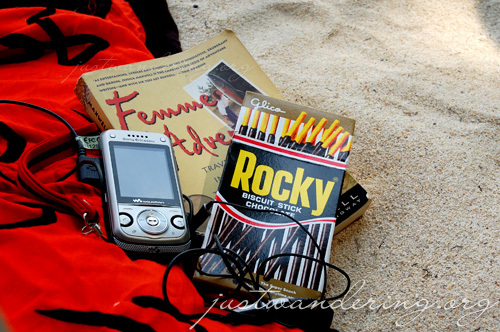 Beach must haves: a sarong, happy music, a good book and a box of Rocky. Then it was business as usual. I set up shop in the reception area, plugging my laptop and my mobile phone to charge. I finished up just before lunch, to head back to my room and pack up my things for check out at 12 noon. Since my boat isn’t until 4pm, I leave my things behind the reception desk and headed down to the beach for some light reading and uh, people watching. That cheered me up immensely, and after baking for a while, I head back the restaurant for lunch, pick up my laundry and pay my bill. I played games on my phone while waiting for the boat, and as I was starting to really get into the game, the receptionist taps me in the arm because the boat is already waiting. She shyly asks me why I only stayed for one night. I was asking the same question myself. But really, I was ready to leave. The ride back was uneventful — it was more forgiving to the bottom, since the boat was full compared to the ride going to the island. Back in Kuala Besut, I headed straight to the bus station to get tickets for the 9pm bus to Kuala Lumpur. I was able to get a seat, and I walked over to the playground to pass the time until I had to have dinner. Dinner never happened though. I was too content just sitting in the gazebo staring at the sea. 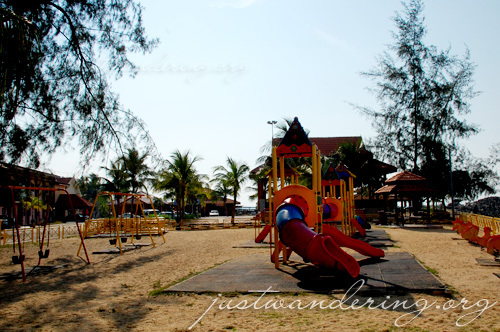 I didn’t like Kuala Besut when I got there the other day, but at that moment, I fell in love with the place. From five o’clock until eight, I just sat there, thinking about things I shouldn’t be thinking about. Still, that was easily the best three hours I’ve ever spent. The girl at the ticket counter said to be at the station by 8:30pm. As soon as all the passengers in the list are on board, the bus pulled out of the station, even if it wasn’t 9pm yet. We stop to pick up a couple of passengers in Jerteh and Tanah Merah, but the bus never even got halfway full. The seats were comfortable, but predictably, I was having a hard time falling asleep. I did manage to doze off a couple of times, but most of the time, I was looking out of the window and still thinking. Suddenly, the view outside was spinning. The bus was spinning on the road, before finally landing its end in a ditch. As we were registering what just happened in our heads, another ar crashed into the bus, pushing us further into the ditch. Since you’re blogging it, you must be okay, but… wow! During my Thailand trip I rode public transit, and twice we passed the scenes of recent accidents. Both times the drivers, one was a tuk-tuk, and one was a bus, laughed. They LAUGHED at the scene of the accident, and made disparaging remarks in a mix of Thai and English. Are Malaysian drivers similarly callous? How did your bus driver react to being the one IN the accident? I’ll be ooking forward to your follow-up story. Again, and most of all, I’m glad you’re safe! That three hours sitting and looking at the water sounds nice. 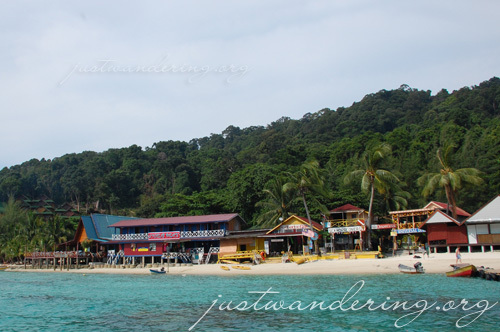 And as for why you only stayed one night… I need to check your previous entries, find out the details on this island. It sounds delightful. Cripes! Good thing you’re okay! Davidd: I wanted to take photos, but thought better of it. I don’t think it’s appropriate. And I was shaking so bad. Ferdz: We were lucky it was just a ditch and not a ravine! Nobody was injured naman. Kaoko: They’re all safe and sound!